You’re off on a race around the world to “explore God’s love for the Nations!” The Tower of Babel leads us to an amazing discovery: we’re all part of one incredible race of people descended from Adam and Eve. Your Vacation Bible School will answer a ton of important questions your kids (and church) ask today. 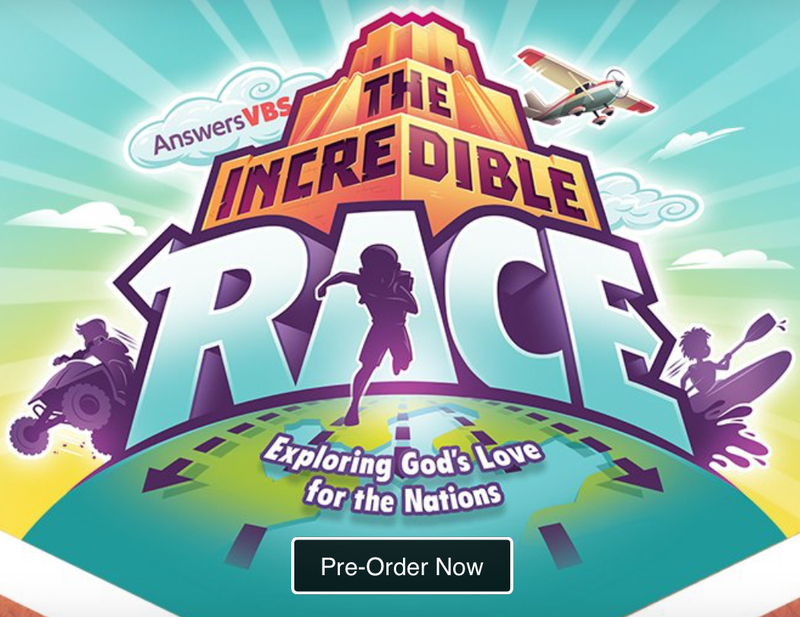 Pre-Order The Incredible Race by Answers VBS HERE. Every day, VBS kids will speed to locations around the world to learn how the Tower of Babel affected mankind. First, on Day 1, kids will race through Genesis to learn about the world ‘before Babel’–Creation, the Fall, and the Flood. Day 2 brings the roadblock of Babel where God confused the languages and people dispersed around the globe. Then, on Day 3, kids will see how mankind is not made up of many different races. Rather, we are one race, created in God’s own image. Day 4 introduces kids to Jesus, the Savior of the World. He reaches out to all nations and offers salvation from the brokenness of sin. At last, Day 5 wraps up the meaning of Babel for people today. Because God loves us, we ought to love others, no matter what they look like or where they came from. READY, SET, SING: The Incredible Race Curriculum comes with 8 incredible songs performed by contemporary band, The Lads! Theme song The Incredible Race highlights that we are one race united under God, in super fun Imagine Dragons-like pop. After that, Gonna Lift You Up reminds us that God is worthy of worship no matter life’s circumstances. Build Your Life encourages us to build our lives on the cornerstone of Christ, and certainly nothing else (c’ya, Babel!). Following, Incredible Grace gives a clear explanation of the Gospel in electronic pop. The beloved ukulele makes an appearance in Jesus Saves, a simple song about the power and love of Jesus. Finally, your VBS music closes out with twangy We’re One Blood which celebrates our unity as God’s jewel of creation! If you’re more interested in traditional music for your VBS, Answers offers an alternative 7-track CD just for you. Icebreaker Ball: Jumpstart great conversations with your VBS kids with an inflatable ball loaded with questions about Jesus, the Bible and the diverse world around us! Sticker Passport: Passport, please! Immerse your VBS kids with attendance stamps and global stickers every day! It also includes daily memory verse and animal pal stickers. Color-in Backpack: Give your kids the coolest carry-on. This personal, color-in racer backpack starts as a craft and also becomes their very own lightweight backpack, perfect for the big race!